I feel like a child talking to Santa, amazed, inspired and a little intimidated. I know that I am experiencing something very unique, very special. I’m sitting on a bench next to Jason Romero, one of my favorite person on earth. He is ecstatic, but most of all, he seems exhausted beyond words. Just like me, Jason has RP and is legally blind, just like me, Jason is a runner and a triathlete, but unlike me, Jason just ran across America in 64 days. Let me take a step back and give you more details about this amazing individual. Jason emailed me a few months ago, I had never heard of him. He said that he was a reader of this blog and that he wanted to be in touch. I was very moved, I started to learn more about him, I was inspired right away. Jason was diagnosed with RP when he was 14 years old. Like most of us, he was told that he had to give up his dream, he wanted to become a lawyer. In the parking lot after that doctor’s visit, Romero’s mother burst into tears, this was the first time that he saw her cry. He was warned that most blind people can’t work (the unemployment rate for people legally blind is over 60%,). Thankfully, Jason simply ignored the doctor’s dismal prophecy and went on to become an honor student, attorney, business executive at GE and Western Union, and CEO of a non-profit school for children with Autism (one of his kids has autism). When his vision started to really deteriorate, he went into a deep depression, his doctor wanted to put him on medication. But Jason didn’t like that solution, so he focused on running. And running. And running. It was good for his mental health of course, but it became a cause, too. Now, let me give you a few facts: Jason is a 2:50 marathoner, he currently holds world running records in 50K, 50-mile, 100 mile, 24 hour, 48 hour and 72 hour race distances and times. He is a 3-time IronMan triathlete and represented Team USA with a 4th place finish at the Paralympics. Not bad! Even better, in February, Jason became the first legally blind runner to win an ultra race — the 50-mile San Jorge race in Puerto Rico — and did it without a guide. I guess that they have trouble keeping up with him. He followed the leader for 30 miles and When the leader faded, Jason ran off by himself and won in 7 hours, 23 minutes, breaking the course record. On March 17, 2016, Jason was in LA with a good friend of mine, Richard Hunter. 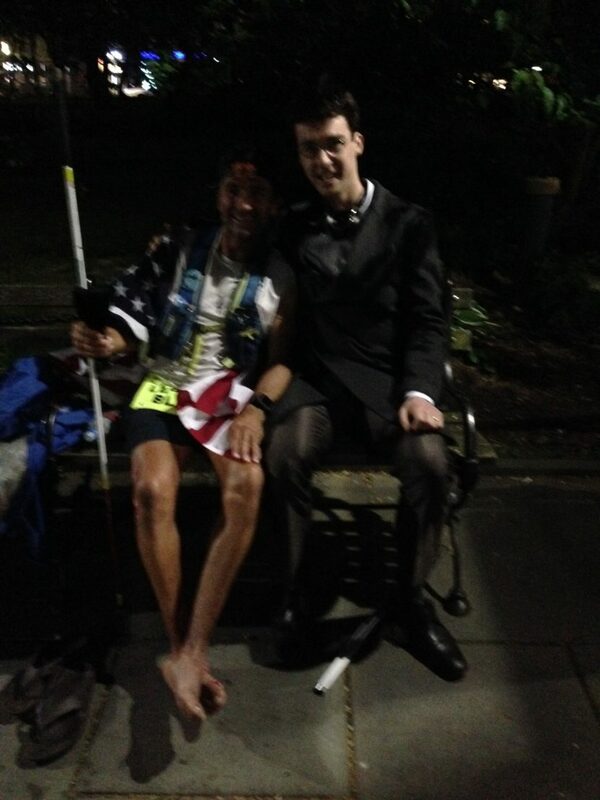 They ran together for a few miles, that was the beginning of Jason’s trip across America. He ran 50 miles per day for 64 days, until I finally was able to meet with him on this bench, in front of City Hall in New York City. Think about this again, 50 miles per day, that’s about two marathons, for 64 straight days… That’s incredible! All I can see is his powerful headlight, a beacon in the New York City night. It helps him to see shapes and yellow lines on the pavement, but he stumbles and falls a lot. He has dozens of scars, he recently walked into a street sign and cut open his face. I would like to tell him a thousand things, but suddenly I have no words. I am shocked by this scene. It is fascinating to contemplate someone that just accomplished an incredible feat. A part of me is very angry. Where are the cameras? Where is the crowd? People walk around the scene going about their day, not even aware of this Hercules. Jason doesn’t remember me, he is too tired to have a conversation. But what we experience is beyond words anyway. Simply AMAZING… You speak so beautifully Charles!